The Self Propelled Howitzer “PzH 2000” of German Defense Company Krauss-Maffei Wegmann (KMW) “sets a worldwide standard”, according to the company. Athens bought the howitzers a decade ago for €200 million, a deal which is now the centre of allegations about dubious flows of money in connection with two former German parliamentarians. The PzH 2000 is a highly mobile and flexible weapon system which is deployed in both conventional missions as well as in asymmetric mission scenarios as indirect fire support. The fully automatic handling of the 60 round on-board ammunition reserve and a modern and precise 155 mm/ L52 ordnance enable the engaging of targets at a high rate of fire – within the shortest amount of time. 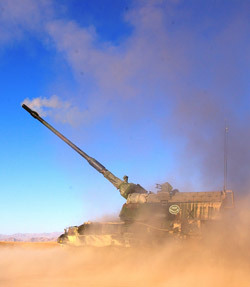 These characteristics make the PzH 2000 to the most effective artillery system in the world – and to an absolute standard for modern artillery. The two were members of the German Parliament for the Social Democratic Party (SPD) from 1980-1990 and from 1980-1994, respectively. One of them was the chair of the German-Greek Parliamentary Group, the other was the vice-chair of the Defence Committee. After leaving parliament they founded the consultancy firm “BfS” (“Office for Southeast European Consultancy”). During 2000 and 2005 the consultancy firm allegedly received more than €5 million from KMW, according to a recent investigation by Pricewaterhouse Coopers that was instigated by KMW because of Greek prosecution related to arms exports to the country worth €2 billion. The investigation has reportedly revealed that those payments were made without an identified cause, raising the question of whether the fees, which may have given the former parliamentarians the incentive to push for the sale, facilitated the lavish defence spending that contributed to the Greek national budget deficit. The case also touches a soft spot for the SPD, which just last year campaigned for more careful and reduced defence exports, more inclusive decision-making, and a more transparent and public reporting system. Despite an announcement of these changes by Vice-Chancellor and Minister for Economic Affairs and Energy, Sigmar Gabriel (SPD), German defence exports actually increased during the first four months of 2014. This brought considerable criticism from the political left, though Gabriel claims that he could not have stopped decisions that were made by the previous administration. He did manage to introduce biennial (as opposed to annual) reporting on arms exports. In the case of KMW, it would be interesting to see the results of such “enhanced due diligence.” KMW was ranked in band F (the worst category) in the Defence Companies Anti-Corruption Index by Transparency International UK’s Defence and Security Programme, indicating that it shows little evidence of basic compliance systems in place. The data on which companies and banks are subject to such “enhanced due diligence” is currently secret. Transparency International Germany has called for transparency on when these investigations are being conducted and what the results are before further export credit guarantees are granted. In the annual “Export Credit Guarantees of the Federal Republic of Germany – Hermes Covers” report for 2013, Gabriel wrote: “The federal government is aware that the public increasingly expects transparency in Hermes covered exports – especially with regard to the arms trade. We take this demand seriously and will highlight Hermes covered arms deals in the annual report from now on.” Gabriel will need to be held to account for this promise. Sadly, prosecutors may have to concentrate on tax evasion charges against KMW employees for not declaring the payments properly, instead of possible corruption charges against the former parliamentarians. Such charges may have already fallen victim to the statute of limitation. As the German newspaper Süddeutsche Zeitung reports, investigations are now not only focusing on former employees of KMW, but also on the CEO, who is said to be one of the most important points of contact for the German government when it comes to armament issues. The “strengths” of the PzH 2000 – timing and precision – should guide the response of the involved parties. They must commit to timely disclosure of companies undergoing “enhanced due diligence” and thorough information on Hermes-covered arms deals. In the end, it is about accountability for Greek and German tax payers’ money and their trust in political leaders. The Transparency International UK Defence and Security Programme contributed to this article.